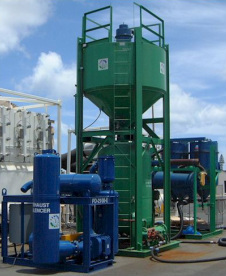 SAFE Systems, Inc. designs and manufactures skid-mounted portable Abrasive Blasting and Recovery Systems. The systems are designed for maximum flexibility while providing the features wanted and needed at a jobsite. On the left is a PD2100E, skid mounted, electric powered 2100 CFM free air Positive Displacement Vacuum. 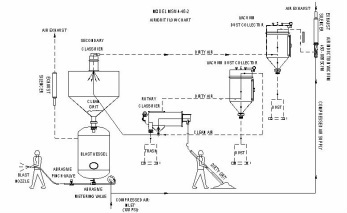 On the right, an MSV-4-40-2, skid-mounted abrasive blast and recovery system. The 40 ton, 4-outlet MSV system has a dual chamber blast vessel, air induction vacuum and two stage classification system.